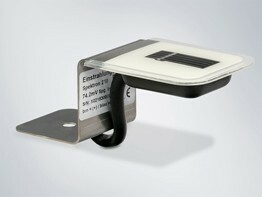 This sensor is for measuring the irradiated energy and is in most cases fixed on the frame of the solar module. Comparison of the irradiated power to thus of the inverter gives a rapid overview on the proper operation of the pv-system. Mounting tip: The sensor comes fixed onto an aluminium profile with an 8 mm hole. Thus screwing onto the module frame is very easy. Please mind, that the sensor does not cast any shadow on the module.